As a Natural-born living among genetically engineered Aristocrats, Ellani (Ella) Drexel didn't think her life could get any worse. But after losing her Programmer father and both of her legs in a tragic accident, Ella's life hits rock bottom. At the urging of her android companion, Meems, Ella begins playing Nexis, a virtual reality game that her father created. In the game, Ella has the use of both of her legs. She befriends a senior gamer named Guster, who recruits her as a member of The Tricksters, a group on a quest to infiltrate the Anansi Chamber in the Central Dominion. 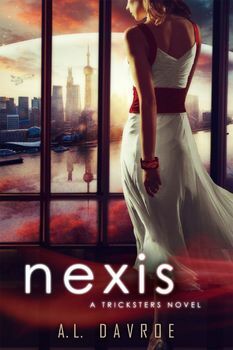 Despite the troubles The Tricksters encounter throughout their journey, Nexis becomes a haven where Ella learns the true worth of life and natural beauty. Ella's newfound self-worth and clarity translate into her real world where she begins to stand up for what she believes in by undermining the authority figures in her life. After she learns the true point of the game (it was created entirely for her to fulfill a rebellious act against Evanescence), Ella is presented with a choice: She can exit the game and continue on her path of diminishment, or she can go back in and fight for what she wants. Fans of Across the Universe and Avatar will love A.L. Davroe's unique cyberpunk Cinderella retelling.